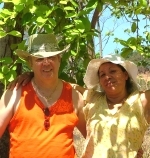 My wife Elizabeth and I retired and moved to her home country of El Salvador in November of 2011. We travel El Salvador meeting the people, seeing the sites and writing of our adventures and offering advice and information to people interested in visiting or retiring here. Please visit us at our Life of a Gringo Expat in El Salvador blog or you can reach us by email. The cost of food depends on what you are buying and where you buy it. I buy fresh vegetables and fruit from the local outdoor markets and it is very cheap compared to the U.S. I get a large bag of tomatoes (10-12) for $1.00, a bunch of onions also $1.00, a head of Cabbage .75 and a large bag of mangos $1.00. Most of these are grown locally year-round. I shop for my meats, canned goods and cereals at Selectos, Wall-Mart and PriceSmart(a store like Sam’s Club or Costco). There prices are about the same or a little more than in the U.S., Elizabeth and I spend about $60.00 – $70.00 a week for food and that is because I eat American style if you eat Salvadorian style it would be a lot less. The cost of utilities is about the same as in the U.S., we have a 3040 sq. ft. home with everything you would find in an American home except heat and our electric bill averages $200.00 a month. Our Internet service costs $20.00 a month and Dish TV costs $12.00 a month. There is no tax to speak of unless you have a business or are very wealthy. There is no tax on money made outside of the country. There is no land tax unless you own very large amounts of land. We have not paid any tax/fee other then the yearly cost to register our car ($35.00). There are fees when registering and deeding property which are one time fees. For Medical care here you have Cigna, Allianz, Bupa and Aetna to name a few that offer expat insurance in El Salvador, I think they are very reasonable. You can create a plan that fits your needs. They have very good hospitals and doctors (many English speaking) in San Salvador A visit to a specialist costs $25-$35 a visit, blood tests usually run $10-$20 and X-rays run $15-$25. El Salvador is not for everyone, but if you are tired of the snow and cold winters or you will not be able to live well on what you have for retirement in the United States then I would suggest you check out El Salvador. I enjoy it here very much. I wonder where in El Salvador one can build a house for less than $ 100,000. No in a good city area, perhaps in a town outside the capital limits? …? I wish I would be as brave as you are, we moved to the USA 33 yrs ago and it is almost time to retired , but we are afraid to go back to our country. I know we probably can live comfortably with our social security pension, but homes in the city are expensive like here, unless you buy in a dangerous town. We are glad that you can lived in our country. Enjoy it. Hope one day we can comeback to live there too. My husband is also from El Salvador and we are planning to retire there in about a year. How do you receive your social security retirement check ? With a small social security check, I decided to move here, El Salvador. Luckily I have a Salvadoran wife who is waiting for her 62nd birthday so that we can travel more. We built a lovely home for $80,000 in a peaceful little city. While not for everyone, this is a place of spectacular beauty, incredibly friendly people, 100 miles of gorgeous beaches , mayan ruins, cheap public transportation. Most people here earn between $100-300 a month so the country is full of poor people living hand to mouth. I have my social security deposited to my bank in USA, and with the bank’s debit card I draw cash from ATM machines, My bills are $3 for water and garbage, $20 for electricity and cooking gas is three dollars a month. In comparison to my working life, and the poverty I would have in USA I am living happily ever after. Highly recommended. Now I’m learning that its possible to live quietly in El Salvador. I’m looking to rent an apartment for 6 months. I need internet. Any apartement do recommend ? I bought a home in El Salvador six months ago, but still live in the US. I come down every two months to pay bills. They tell me I cannot open a bank account because I don’t live there full time and cannot pay bills online. I would love to move there full time as I am about to retire but opening a small part time business in the US. I would move to El Salvador before the end of this year IF I could get a part time job or open a small restaurant. I have never been scared when traveling in El Salvador. The thought of starting a business there does bother me because of extortion. Slowly learning Spanish and would love to have some friends there. I am looking for a place to retire early. I am considering possibly retiring overseas where my money can go farther and for a better quality of life. I have a friend who is from El Salvador. His wife and children are back home and he sends them money, but he is planning on going back in two years. He has invited me to visit and even offered me a place to stay. If you like to stay in touch my e-mail address is carabamd@gmail.com. I too would like to have some friends there. I wish all the best. El salvador is one of the most expensive places to live south of the USA. Your money would go farther in Peru, Nicaragua and Ecuador. El salvador is primarily a consumer nation with no solid domestic industry. The nation lives mostly off of foreign remittances which creates an artificial level of wealth amongst people who are mostly unemployed or severely under employed. Hence, you will basically pay the same or more for groceries, gas and technology goods. Rent is cheap of you live in the outlying pueblos. However your safety is at risk since maras/gangsters are found even in remote villages. If u are not a salvi citizen, forget about running your own business. You will be taxed by local thugs, sabotaged by the culture of “invidio” or drowned in endless bureaucracy. If you are making less than $2000 a month on retirement or pension, you would be better off looking elsewhere. I am a gringo married to a salvadoran citizen. I have luved in el salvador on and off for more than 5 years. does the US state department require you to return to the States for any reason ? We would but I wonder if you MUST ? Hi; anyone recently moved to retire in El Salvador??? We are looking to sell our house in El Salvador. It is in a local beach area. We were the first gringos in our quiet community. Now there are several. We planned on retiring there but now we have three grandbabies and want to be closer to them. Asking $75k usd. Steps to beach, 15 min to big town/grocery, 45 min to airport. Kim – your place sounds interesting. Please jot me a note, hwmemberships@hotmail.com. Gringo looking to retire in El Salvador. We are planning to move to El Salvador next year and I would like to get some suggestions on companies that helps you move from the USA to El Salvador. Please let me know.